First Appearance: X-Men (vol. 1) #54 (Mar. 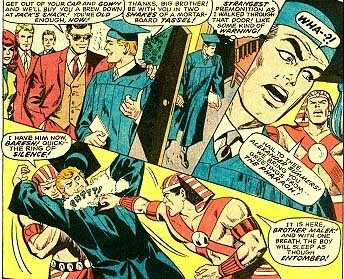 1969): "Wanted: Dead or Alive -- Cyclops!" First Appearance (Additional Details): (Alex) X-Men (vol. 1) #54 (Mar. 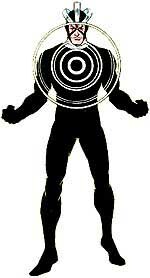 1969): "Wanted: Dead or Alive -- Cyclops! 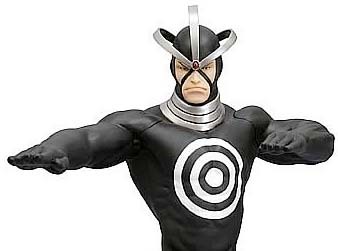 "; (as Havok) X-Men (vol. 1) #58 (July 1969): "Mission: Murder!" 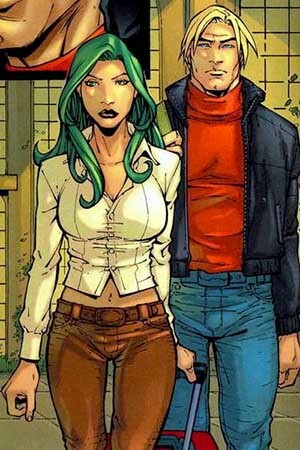 Alex Summers studied geophysics in college. Spider-Man and X-Factor: Shadowgames #1 (May 1994): "Shadow-Games"
Spider-Man and X-Factor: Shadowgames #2 (June 1994): "Shadowclash"
Spider-Man and X-Factor: Shadowgames #3 (July 1994): "Shadowfall"
The Uncanny X-Men (vol. 1) #250 (Late Oct. 1989): "The Shattered Star"
X-Factor (vol. 1) #71 (Oct. 1991): "Cutting the Mustard"
X-Factor (vol. 1) #72 (Nov. 1991): "Multiple Homicide"
X-Factor (vol. 1) #73 (Dec. 1991): "Crowd Control"
X-Factor (vol. 1) #74 (Jan. 1992): "Politically Incorrect"
X-Factor (vol. 1) #75 (Feb. 1992): "The Nasty Boys"
X-Factor (vol. 1) #76 (Mar. 1992): "X-Communication"
X-Factor (vol. 1) #77 (Apr. 1992): "Great X-pectations"
X-Factor (vol. 1) #78 (May 1992): "Playing with Fire"
X-Factor (vol. 1) #79 (June 1992): "Rhapsody in Blue"
X-Factor (vol. 1) #80 (July 1992): "Belles & Whistles"
X-Factor (vol. 1) #81 (Aug. 1992): "Belles of the Ball"
X-Factor (vol. 1) #82 (Sep. 1992): "Sittin' by the Dock of the Bay"
X-Factor (vol. 1) #83 (Oct. 1992): "Painting the Town"
X-Factor (vol. 1) #87 (Feb. 1993): "X-aminations"
X-Factor (vol. 1) #88 (Mar. 1993): "...Random Violence"
X-Factor (vol. 1) #89 (Apr. 1993): "Dark Homecoming"
X-Factor (vol. 1) #90 (May 1993): "A Green and Tender Place"
X-Factor (vol. 1) #91 (June 1993): "Underpinnings"
X-Factor (vol. 1) #92 (July 1993): "The Man Who Wasn't There"
X-Factor (vol. 1) #93 (Aug. 1993): "The Longest Day"
X-Factor (vol. 1) #94 (Sep. 1993): "The Longest, Day Part 2: Eveningwhere"
X-Factor (vol. 1) #95 (Oct. 1993): "Fatal Repulsions"
X-Factor (vol. 1) #96 (Nov. 1993): "In the Beginning"
X-Factor (vol. 1) #97 (Dec. 1993): "The New Humanity"
X-Factor (vol. 1) #98 (Jan. 1994): "Into Oblivion"
X-Factor (vol. 1) #99 (Feb. 1994): "The Cure!" X-Factor (vol. 1) #100 (Mar. 1994): "Mahapralaya!" X-Factor (vol. 1) #100 (Mar. 1994): "I Am Haven"
X-Factor (vol. 1) #103 (June 1994): "Friends and Family"
X-Factor (vol. 1) #104 (July 1994): "Malicious Intent!" X-Factor (vol. 1) #105 (Aug. 1994): "Final Sacrifice!" X-Factor (vol. 1) #107 (Oct. 1994): "Punch-O-Rama"
X-Factor (vol. 1) #108 (Nov. 1994): "Promised Vengeance"
X-Factor (vol. 1) #109 (Dec. 1994): "The Waking"
X-Factor (vol. 1) #110 (Jan. 1995): "Creatures On the Loose!" X-Factor (vol. 1) #111 (Feb. 1995): "Explosive Performance!" X-Factor (vol. 1) #112 (July 1995): "Wreaking Havok, Part 1: Unnecessary Evils"
X-Factor (vol. 1) #113 (Aug. 1995): "Wreaking Havok, Part 2: Impulsive Behavior"
X-Factor (vol. 1) #114 (Sep. 1995): "That Certain Mystique"
X-Factor (vol. 1) #115 (Oct. 1995): "Reaching Out to Yesterday"
X-Factor (vol. 1) #116 (Nov. 1995): "Home Comings"
X-Factor (vol. 1) #117 (Dec. 1995): "Adversaries"
X-Factor (vol. 1) #118 (Jan. 1996): "Havok's Fall"
X-Factor (vol. 1) #124 (July 1996): "Future Memories"
X-Factor (vol. 1) #125 (Aug. 1996): "The Ticking Clock"
X-Factor (vol. 1) #133 (Apr. 1997): "Down Under"
X-Factor (vol. 1) #137 (Sep. 1997): "It Was a Dark & Stormy Night"
X-Factor (vol. 1) #138 (Oct. 1997): "Fear Walks Amongst Us"
X-Factor (vol. 1) #139 (Nov. 1997): "The Enemy Within"
X-Factor (vol. 1) #143 (Mar. 1998): "The Fall of the Brotherhood (Part 1)"
X-Factor (vol. 1) #144 (Apr. 1998): "The Fall of the Brotherhood (Part 2)"
X-Factor (vol. 1) #145 (May 1998): "Phantoms"
X-Factor (vol. 1) #146 (June 1998): "Fairie Light"
X-Factor (vol. 1) #147 (July 1998): "Bashed!" X-Factor (vol. 1) #148 (Aug. 1998): "Sorry Is the Hardest Word!" X-Factor (vol. 1) #149 (Sep. 1998): "Times Change"
X-Factor Annual #7 (1992): "The Historians of Tales to Come (Shattershot Part 3)"
X-Factor Annual #8 (1993): "Charon"
X-Factor Annual #8 (1993): "What Have You Got to Hide?" X-Men: Divided We Stand #2 (July 2008): "The Hole"